Triathlete. Cyclist. Lover of emergency PopTarts. Irrepressibly curious, I know that nothing worthwhile has ever been achieved without hard work. In my Advanced Physiological Assessment class the other day, we conducted a body composition lab which measured body fat using a variety of clinical assessment tools including bioelectric impedance analysis (BIA), underwater weighing (UWW), and DEXA scanning. These tools use either electrical currents, x-ray scans, and Archimedes’ Principle to measure body density which is then converted to body fat. The conversion formula is then selected based on race, age, and gender, with many groups that are underrepresented. As a white, 21-year-old female, I was privileged in that there was a formula that was representative of my body. While the methodology is a little different, all of these tools rely on the principle that fat is less dense than water, muscle (which has a lot of water), and the other components of fat free mass, like bone and soft tissues. Some of these are pretty good assumptions, while others, like bone density can be highly variable. On lab day, I was pretty excited. I am a 21-year-old competitive cyclist and triathlete, and as an exercise scientist, I am genuinely curious as to how my numbers compare to population norms and other athletes (to give you an idea, I voluntarily did a lactate threshold test which involves having your fingers repeatedly pricked during a graded exercise test just for funsies #nerd). I followed the protocol as best I could, holding my arms straight out and standing tall during the BIA, exhaling ALL of my air during two trials of underwater weighing, and laying perfectly still during the 7 minute DEXA scan. The rest of the classifications are “very lean”and “excellent.” There are so many problems with this that I hardly know where to begin. First, the 2010 ACSM Body Composition Table for Women developed these norms based on patients from the Cooper Clinic in Dallas, Texas. As my professor pointed out in class, people who have their body composition measured tend to be rather self-selecting- athletes looking to “cut weight” for sports or individuals on weight loss programs to see how much fat loss is appropriate. The Cooper Clinic is a medical center that specializes in “comprehensive preventive exams.” By looking at this chart, I can only assume that they have a “very lean” patient base if the 50th percentile for a female between the ages of 20-29 is 21.0%. In fact, my most accurate number, which I will assume is from the DEXA scan, wouldn’t be exactly average until I was 40. Anecdotally, most of my female college of health sciences peers have body fat percentages around 25%, which is likely lower than campus as a whole. One would think that surely, this is the result of a small sampling base, but no, the listed sample size for my age group, 1360, with a total sample size of 12,116 for all females. If the average female wears a size 14-16, and I wear a size 4, it would make sense that I would be more towards the left side of the bell curve. The American Council on Exercise classifies obesity for women as having a body fat of 32% or higher. The ACSM chart stops at 38.9% for 20-29 year old females and 40.5% for 70-79 year old females as being the top (fattest) 1%. If 64% of American women are supposedly overweight or obese, these “norms” are clearly NOT representative of the United States female population. The second problem with this chart is the very narrow classification ranges. I completed all four tests within 30 minutes of each other and got a wide range of results. On the 2010 ACSM chart, a difference of 2.6% moves you from the midpoint of “poor” to the midpoint of “fair.” I had a 2% difference between the scale and handheld BIA when they were both on the “athlete” setting. With such varied results, how can healthcare professionals make recommendations using this chart in good conscience? Finally, the classification terminology is demoralizing and clinically meaningless. I would like to point out that essential fat, the fat that is necessary for normal healthy functioning for females is around 12-14%. Without it, your organs, central nervous system, muscles, and brain would not function. On this chart, values lower than that is not called “anorexia,” but “very lean”. Which, if you’ve listened to the health/fitness/diet industry lately, “very lean” is what we should all be striving for, right? I will concede that there is an asterisk next to the “very lean” classification that does state that body fat percentage less than 10-13% is not recommended for females. I will argue that “not recommended” doesn’t even touch the gravity of that lethal situation. That should be a call for medical attention. Unfortunately, “very lean” is the only descriptive term used on this chart. “Excellent,” “Good,” “Fair,” “Poor,” “Very Poor” are completely subjective terms that have no clinical significance whatsoever. They are fat-phobic and encourage the orthorexic ideal that a lean body is the only kind of good body. I’d like to emphasize that this is the chart for the American College of Sports Medicine, the most respected medical organization that writes health and fitness recommendations for the general public. These are doctors, researchers, rehab professionals, professors, and trainers that rely on their information to make well-informed decisions regarding patient care every day. There are other normative charts available, like the one mentioned above from the American Council on Exercise, although their terms, “essential, athletes, fitness, average, obese” aren’t much better. I’ve seen a similar chart where “average” is replaced with “acceptable.” I know many athletes who have body fat percentages much higher than mine. They are no less, perhaps even better, athletes because of it. I think that statement gets to the heart of the problem. What exactly is an acceptable body? Is it one that is healthy and functions as it needs to? Or is it just a thin body? If we rely on size as a quick indicator of good health, we’re not even measuring what is actually indicative of cardiovascular health- how the heart, lungs, and muscles work together. I know that my “poor” body fat percentage doesn’t mean I’m unhealthy- my other physiological markers such as blood pressure, lactate threshold, cholesterol and VO2 max all show that I have excellent cardiorespiratory fitness. My behaviors (which are perhaps even more indicative of long-term outcomes) like engaging in regular aerobic and strength training exercise, eating a healthy balanced diet (I like something similar to 80/20), taking time for self-care, not smoking, and getting enough sleep agree with that. Fortunately, the ACSM has updated many of their exercise prescription recommendations as of 2015. Some updates are expected in 2017, but I am not sure if the body composition norms will be included. For now, I’m taking these results with a grain of salt. I know that despite what the ACSM has to say, my body is good, acceptable, perhaps even above average no matter how much fat I have. 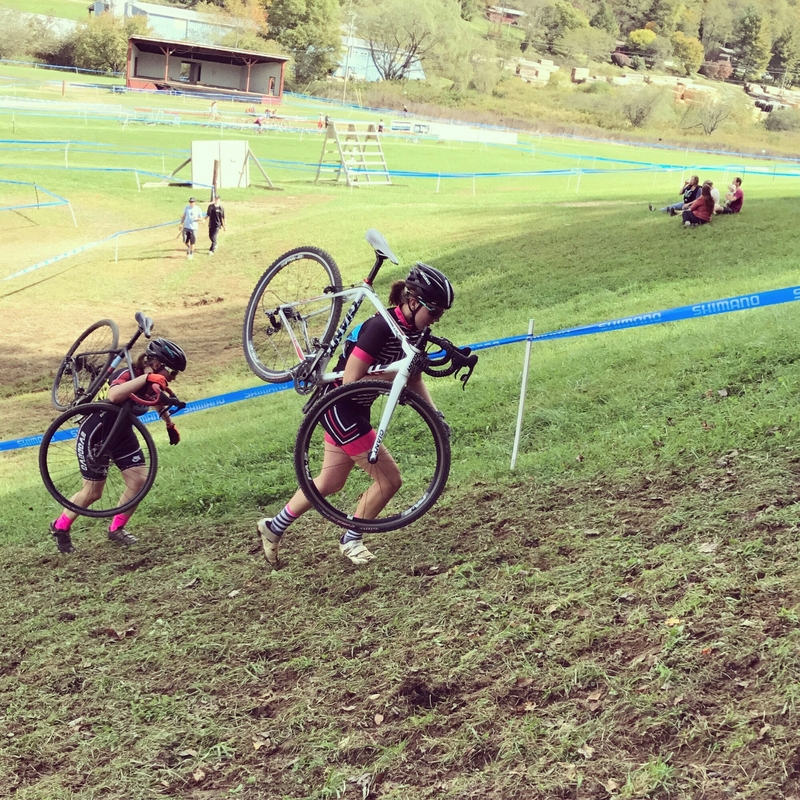 Charging my way up the run up at the Boone Town Throwdown CX race!